From the first day we met, cycling and racing have made my life better. The sport has allowed me to meet wonderful people and push myself harder – physically and mentally – than I ever imagined was possible. After doing my time on a hand-me-down road bike and getting lots of pushes during the local group rides, I decided to try racing. With a new bike, I met my first road coach at a race; she wasted no time putting me on the fast track, and quickly developed a training program after doing VO2 and power threshold tests. It was then that I realized the importance of the right information, equipment, and hard effort. Through dedication and stubbornness, I moved up the road racing ranks quickly – I raced aggressively and never shied away from working for my teammates. Truthfully, though, my true satisfaction came from the process and the training – I was a budding data geek. Inevitably, burnout took hold and I decided to take a break from racing and training. However, I soon realized that I was a much better person with cycling in my life. I needed the stress relief, time outdoors, pure enjoyment, and that level of discipline that accompanies being a determined athlete. I vowed to never give it up again, but was looking for a different, more meaningful challenge. It was around the time I started working for TrainingPeaks that my boyfriend introduced me to mountain biking and, despite multiple crashes, I was hooked. Only a few months passed before I decided to dedicate myself to training for The Leadville Trail 100 through raising money for First Descents. In pursuit of a sport that was beating me up, and being focused on giving back through cycling, I had marked a new beginning. 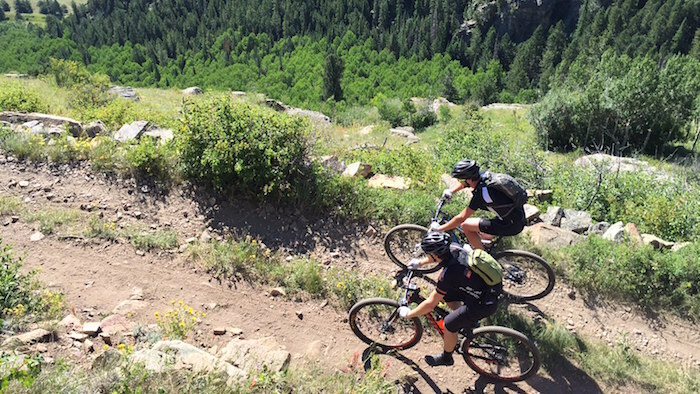 In preparation for the LT100, I started working with Carmichael Training Systems (CTS) coach Daniel Matheny, who is an expert in MTB endurance racing (and also writes for the TrainingPeaks blog). I didn’t want to just complete the LT100, I wanted to feel like I was racing it. I trained heavily on the road bike doing structured power-based workouts, which made sense with my busy schedule and desire to keep a work/training/life balance. Without a power meter on my mountain bike, my weekend miles on the MTB were focused on skill building and just going as hard as I could. Trying to keep up with my experienced boyfriend and friends pushed me to ride over my limits, but often left me overextended. This seemed to tire me out for technical sections, crushing my confidence as my skills were still quite lacking. I used a Garmin Edge 500 that records heart rate and GPS, but only tracking heart rate seemed to underestimate my efforts and report extremely low calorie burn for my perceived effort. Mountain biking requires a lot of short bursts of effort to get over rocks, roots, and steep pitches; I was underfueling for the intensity without realizing it. I found myself avoiding training on the MTB during the week since I wasn’t getting the data I felt I needed based on my prescribed structured power workouts. I then found myself asking, should I be training more on my MTB, and if so, how do these power workouts that I do on my road bike translate? I could do them on my MTB, but how will I know if I’m doing them correctly? Are my training zones (HR, power) the same or different on the road and the MTB? The questions grew after doing my first few mountain bike races. I wasn’t sure how to pace myself, and although I knew this would come with experience, I wondered if having power/kj data to analyze post-race would assist my coach and I. For example, I wondered, can I go all out on a climb and for how long, being that I still need energy left to handle a technical descent and put out big power through the fire road sections? Since I jumped right into racing, I didn’t have much time to figure this all out and was competing against women with several years’ more experience. As I stayed with my coach’s program, training on the road and riding my MTB as much as possible, the results came quickly. I was winning races and was able to achieve pro status in one year. Now it’s a completely different game and level of competition; I need to know how much more power (specifically on my mountain bike) I need to be competitive as a pro. Will looking at my mountain bike power data allow me to determine what my strengths and weaknesses are, such as XC, endurance, ultra endurance? So, here’s the problem I’m identifying: As a focused and goal-oriented mountain biker, I am not finding the information I need on how to train and race with power on a mountain bike. I read a lot of articles discussing the importance of training with power meters and how to apply the resulting data, but don’t see how it all transfers to my MTB training and racing. Should there be a specific “power profile chart” for mountain bikers? Should coaches prescribe power-based training on mountain bikes? Wanting answers, I have teamed up with Quarq, TrainingPeaks, Hunter Allen, and Daniel Matheny (my CTS coach) to investigate training and racing with a mountain bike power meter. In addition, Hunter Allen will analyze my race files and compare them to last year’s data and identify significant differences in performance. Daniel will also be providing feedback on how having versus not having power data affects his management, planning, and analysis of an athlete. Through this process, my hopes are that this series of articles will offer useful information and answers to other mountain bikers who want to use power analysis in their training. Tammy Sadle is a professional MTB racer for Honey Stinger/Bontrager Pro MTB Team, a Quarq sponsored athlete, and Customer Support Manager for TrainingPeaks. Follow her at'@tnsadle.